Yesterday I tried out Brasserie Vrooden's Dunkel, today I'm checking out their La Tropicale Blanche aux fruits from their off-series. 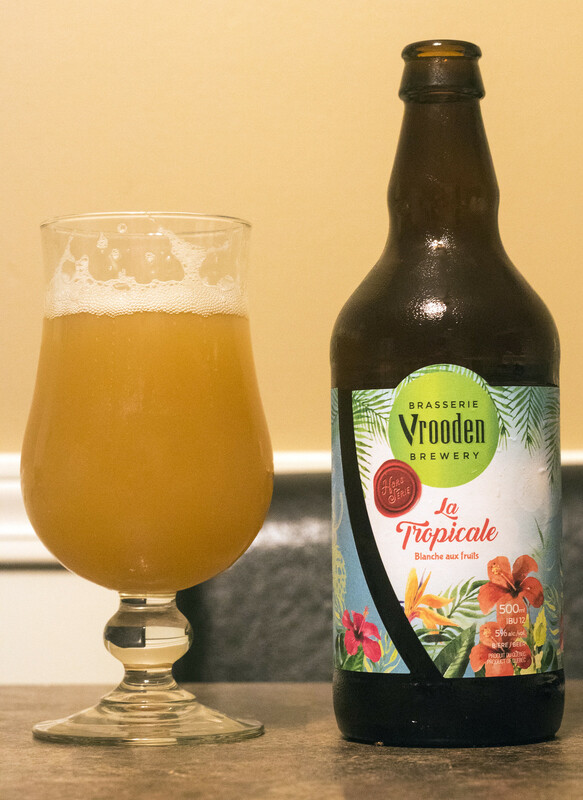 La Tropicale is a Fruity Witbier brewed with mango, pineapple and peach. Appearance: Pours like your typical every day witbier - it's a hazy, dark orange wheat ale with a hefty cloudiness to it. Looks a bit like if you were mixing some Good Host iced tea mix in some water, like that to a point. There's also a good amount of off-white head that diminishes for the most part, only leaving behind a few clumps behind. Aroma: Definitely a Tropical witbier. The first thing that popped in my mind was the Milkshake IPA trend - a very sweet, tropical style of IPA that has a good dose of lactose to it.. this one has a good deal of fruitiness reminiscent to that style (but not the lactose, etc). There's notes of mango, pineapple, and peach in here. I was expecting the typical spiciness of coriander to pop up in here but there may be only a slight hint of it.. at most, but that being said.. my sinuses are completely blocked up so I'm lucky to smell anything right now. Taste: This is definitely getting into more familiar territory, the first sip I have is a mild bready presence from the Belgian yeast being used, decent amount of breadiness here. There's a good amount of sweet and tart fruitiness in this beer, sweet notes of pineapple and peach, tart notes of mango. Even with my sinuses not being the best, I do get a light-to-moderate amount of coriander spice finally that happens to leave behind a bit of a spice aftertaste on the tongue. La Tropical Blanche is fairly dry but very very carbonated for mouthfeel, a bit gassy for my stomach. Overall Thoughts: I haven't had many Belgian-style witbiers in the past year or two, so it's nice to try a new one! This one has your typical bready presence of the Belgian yeast, a bit of coriander, but also has some of the flavours that are quite common in some of the current trending styles of beers. This has a good deal of sweetness and tropical presence to it - pineapple/peach for sweetness, mango for tartness. It's nice to see a different take on a witbier once in a while, so I'd definitely drink this one again, preferably on tap. Lastly, I find most NEIPAs to be more similar to styles of beer like this than most styles of IPA, it's crazy what kind of styles are being created every week.